The Rebel Sweetheart. : Best Cycling Tours in Vietnam. When it comes to being truly immersed in the people and culture of a country, touring on bike is an efficient and exhilarating way to absorb every molecule of a place like Vietnam. To explore this wonderful, being guided by those who know the ins and outs of the people and country, guarantees a memorable experience. Starting at Ho Chi Minh City, Vietnam Backroads will take you through the south-western region of Vietnam, where the Mekong River approaches the South China Sea. This area is rich in biology, with 10,000 new species discovered here. The region lies immediately west to Ho Chi Minh City, with a variety of visual feasts ranging from mountains and highlands in the north and west, to flat flood plains in the south. Experience the culture of rural Vietnam when you stay in the local villages, where the locals are your host! On your last day you will be taken by boat to the biggest floating market near Can Tho before returning to Ho Chi Minh City. Take an epic adventure cycling from the north to the south of Vietnam! On this 14 day trip, you will cycle 10-75 miles per day, experiencing rice paddy fields, jungles, pristine beaches and the beautiful people of Vietnam. Climb Bi Doup and Thien An Mountains on your bike, take a boat trip to tropical "Whale Island" and venture the historic city of Hue, pedalling over Hai Van Mountain pass or "Pass of the Ocean Clouds." You will be immersed in the culture and beauty of this country and come away with a true experience of Vietnam! 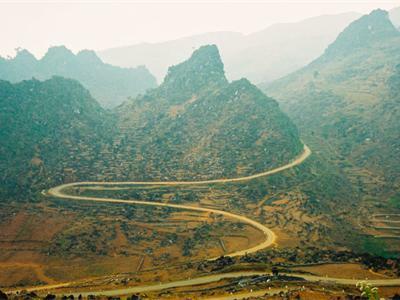 If riding up Indochina's highest peak is your idea of a biking holiday challenge, then cycling the Northwest Mountains of Vietnam is right up your street! Discover the colourful ethnic tribes of the Northwest Mountains that few tourist experience, as you cycle through valleys and river gorges to Dien Bien Phu. Here you will receive a history lesson in the great outdoors, when you learn about how Ho Chi Minh defeated the French. Packed with physical challenge, breathtaking scenery and exhilarating riding, this tour is sure to satisfy the most venturous of cyclists! For 2 days of private touring, Viet Vision Travel will guide you around the city of Hanoi, cycling amongst its historical sites and mingling with the Hanoi locals. Explore the back streets, observe skilled silk weavers hard at work and enjoy coffee with the locals. Experience the Cho Mo markets which are far from the city centre and not commonly visited by tourists. Even a Vietnamese spiritual experience is to be had with a visit to Ngu Xa Temple before enjoying a meal in a private home. So for a cycling experience that is still close to some modern comforts, but shows you the heart of the Vietnamese way of life, this tour was made for you! Author Bio Richard is a cycling enthusiast from Sydney, Australia, who has just returned from a bike tour of Vietnam. He chooses to ride Cube bicycles and recommends cycling tours as a great change of pace and for seeing some amazing sights that you otherwise wouldn’t get the opportunity to experience. I agree that getting out there is a great way to learn about a country. Personally I like to go on a run. what a wonderful way to get around! Very Beautiful! Those trails look beautiful! Thanks for sharing!